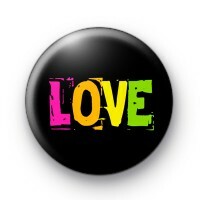 This is a jet black 25mm pin button badge with LOVE in bold bright rainbow coloured letters. Its a little retro looking but I think we can all agree that LOVE makes the world go round. This is one for lovers and romantics. Pin it to your coat and spread the love this Valentines Day - or any day of the year for that matter! Love makes the world go round.